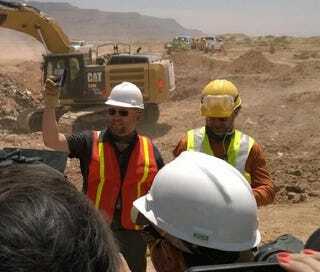 Last year, Alamogordo officials finally approved an excavation of the infamous landfill, and plans kicked into motion two weeks ago, with Microsoft partnering up with a documentary team to dig into the dirt and film the results. Today, it's official. They've found E.T. 's home—though it's unclear whether there are really millions or even thousands of copies down there. The AP reports they've found "hundreds" so far, and we'll keep you updated as they keep digging. Top image via Microsoft's Major Nelson.